Schwarzman’s obsession with money is captured in this snippet quoted on Business Insider. 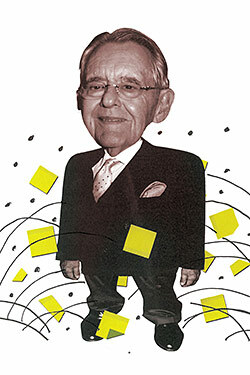 New York magazine quoted our account of Pete Peterson’s sometimes spacey personality, with an amusing illustration. Excerpts about Schwarzman’s unsuccessful effort to recruit Jimmy Lee, the famous banker, as his number 2 and heir in 2000 were published on Clusterstock. The Wall Street Journal’s Deal Journal site carried a passage about the genesis of Blackstone’s IPO and the rivalry between Schwarzman and KKR’s Henry Kravis. TheStreet.com carried an excerpt about the peak of the LBO boom in 2005-2007. Dealbreaker.com remarked on Steve Schwarzman’s efforts to attract girls as a Yale undergraduate. Fortune.com‘s Sept. 28 review provides some more nuggets.